The marriage between Peyton Manning and the Indianapolis Colts whimpered its way to a conclusion on Tuesday night, as Chris Mortensen reported that the team will release Manning to avoid paying the $28 million roster bonus due to the future Hall of Famer. Although Manning could eventually choose to re-sign with the Colts on lesser terms, the decision likely brings Manning’s 14-year career with the team to an end. He finishes with 54,828 passing yards and 399 passing touchdowns in blue and white; only Brett Favre and Dan Marino have more passing yards and passing touchdowns for a single team. While scuttlebutt during the season suggested that Manning was unlikely to play again, the signs now point to Manning returning to play for a new team during the 2012 season. A short video clip of Manning working out at Duke University was leaked several days ago. In it, Manning throws four passes of varying lengths while a camera guy apparently crouching inside a shed films the throws. It’s designed to show off Manning’s arm strength in pads, which should tell you how it got onto the web in the first place. The reality is that nobody in the free market truly knows how healthy Peyton Manning is. Manning knows, his agent knows, and we suspect that the Colts know. The fact that Manning was cleared to play football by a doctor isn’t really newsworthy, because the fusion surgery Manning underwent was designed, first and foremost, to ensure his health. What his medical clearance tells us is that Manning isn’t one hit away from being crippled. So the key factor that will determine whether Peyton Manning can play football again is what that leaked video was made to show — his arm strength. It was Manning’s surprise at his lack of arm strength during last year’s offseason that drove him to the doctor and then to multiple surgeries. His recovery process has been designed to improve his arm strength to the point where he can once again be a viable professional quarterback. At 70 percent, Manning’s arm wouldn’t likely be strong enough to justify significant playing time from a team. 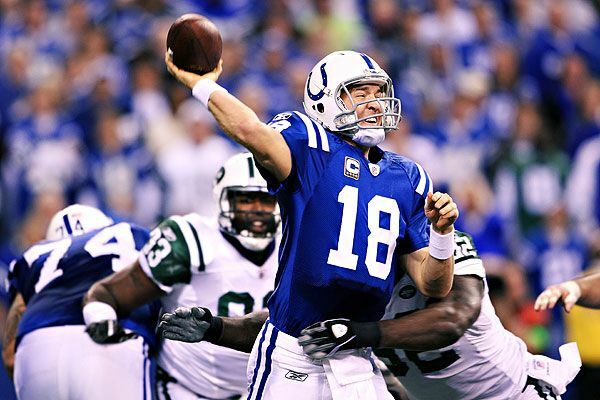 At 85 percent, Manning might have be able to play at the level of a Chad Pennington, where his intelligence and field vision might be able to overcome an arm weathered by injury and age. It seems unlikely that Manning will return at 100 percent or superior to the player that walked off the field on January 8 of 2011, but he could be close enough that it won’t matter. And that’s where the problem in evaluating Manning — and subsequently giving him a huge contract — lies. It’s not entirely clear that NFL teams will get a chance to see Manning throw in person before he hits the free agent market, and since we know that Manning’s capable of passing a physical regardless of his ability to throw the football, an interested party might be forced to guarantee Manning up to $20 million without ever seeing him throw a pass. In fact, they’re almost surely going to do so. Manning hasn’t scheduled a public throwing session or Pro Day-style event yet, and the only time he or his representation would ever consider scheduling one would be in the case that Manning was totally healthy and completely confident that he was back to being the old Peyton Manning. A private workout would also be off the table; what if Manning works out for a team and they choose not to sign him based on that workout? The news would spread like wildfire; it would basically be as bad as a public workout. We still may end up with a situation where Manning requires a certain financial guarantee to sign somewhere and no team is interested in meeting that guaranteed figure, with the result being that Manning retires without ever playing another NFL game. It’s in Manning’s best interest to try and negotiate a deal right now, while his list of suitors is at its highest and he can play quarterback-desperate teams off of each other before they get a chance to sign anybody else. While free agency doesn’t start until March 13, a release from the Colts would make Manning a free agent immediately, meaning that he will be available to sign for several days before the free agent period actually begins. By signing before the 13th, Manning can pick his preferred suitor from the lot of teams around the league looking for a passer before Matt Flynn and Robert Griffin III hit the market. It’s not in Manning’s interest to sit around till May and end up without a chair to occupy. That news also means that the Rams might be smart to deal away the second overall pick before Manning signs. If Manning signs with the Dolphins or Redskins before draft day, it takes away one of RG3’s three key suitors (along with the Browns) and limits the pool of teams interested in St. Louis’ pick. Imagine, if you will, that Manning signs with the Redskins and Flynn heads to the Dolphins on the first day of free agency. That leaves the Browns and Rams in a staring match heading towards draft day. We put together a piece on possible destinations for Manning in December, but as you might suspect, a lot has changed since then. In addition, our first column was considering the likely landing spots for Peyton as part of a Manning trade, not as a free agent. Because of that, we need to reconsider some of the teams we left out and take some of our landing spots for Peyton off of the list. By our count, there are ten teams who seem likely to, at the very least, have some internal discussions about taking a shot at Peyton Manning as a free agent. Most of them appeared on our first list, but we’re removing the Cowboys from that initial list, since we believe that they will be unable to extricate themselves from Tony Romo’s contract as part of a deal. In addition, based on what’s happened over the past three months, we’re going to be placing the teams and their respective chances of getting Manning in a different order. Jacksonville’s only play in the Manning sweepstakes is to basically blow everyone else away with money and sell Manning on their young, talented defense while promising him a shot at two games against the Colts each year. They have no receivers for Manning to work with and a questionable offensive line, which would seem to rule them out. Although the Ravens might be the best actual landing spot for Peyton given how close they are to a championship, they don’t really have the cap space to fit Manning on the roster. Getting Manning would require some pact from about five or six Ravens veterans to dramatically decrease their salary in 2012, and it still might cost them a chance to re-sign promising young cornerback Lardarius Webb. The organization also seems to believe in Joe Flacco, for some strange reason. This would be a curious move, considering the presence of 2010 first-rounder Jake Locker on the roster, but Tennessee has a lot of money to spend and the sort of offense that a healthy Manning would love: A versatile, speedy running back (Chris Johnson), devastating athletes at receiver (Jared Cook and Kenny Britt, albeit recovering from an ACL tear), and a veteran offensive line. And Manning played his college ball in Tennessee, so who knows, maybe he has an affinity for the place. This is also his only other destination that would allow for two games a year versus the Colts. It makes sense on those levels, but the Titans are likely committed to Locker. The Chiefs have more cap space than anybody else in football, so they can likely outbid everyone else for Manning. They could even bring in longtime Manning co-conspirator Jeff Saturday, Peyton’s center with the Colts, to line up in the middle of the offensive line. And wouldn’t it be fun to see Scott Pioli and Romeo Crennel bring on the player they made their name with while working for the Patriots? Alas, the Chiefs want to bring in a veteran to challenge Matt Cassel, not take his job. Cardinals defensive lineman Darnell Dockett was so excited about the idea of acquiring Peyton Manning that he actually miscalculated and threw Kevin Kolb against the side of the bus on Tuesday night. Kolb should be OK. It’s easy to point to Larry Fitzgerald and the Cardinals’ history of bringing in famous veterans for a final run (Emmitt Smith and Edgerrin James come to mind) and suggest that they’ll be players for Manning, but why would Peyton Manning want to play behind what might be the worst offensive line in football? The Niners currently have an enormous hole at quarterback, and while everyone expects them to eventually re-sign Alex Smith, what if a team like the Dolphins suddenly decided to outbid them for the once-embattled first overall pick? Or what if Jim Harbaugh and company decided that they wanted to go for a title in 2012 without having to build a conservative offense around hiding Smith’s weaknesses? Unlike the Ravens, the Niners have the cap room to pursue Manning while retaining their key free agents on defense; it just might cost them some flexibility in re-signing key contributors like Michael Crabtree and NaVorro Bowman in future years. Is paying Peyton Manning $35 million over three years really that much worse than giving Alex Smith a three-year deal for $26 million? The Niners have denied all interest in Manning up to this point, though that may have something to do with the tampering penalties they accrued in 2008. With a ton of talent on both sides of the ball, Manning can look at the possibility of playing with a top-five defense and an offense that features Sidney Rice, Doug Baldwin, Mike Williams, and Zach Miller at receiver. The offensive line remains a question mark and Seattle hasn’t done a great job of keeping those guys healthy. It’s reasonable to wonder if their medical staff will be able to keep Manning on the field. Oh, you didn’t think the Jets would be involved in this discussion? With Mark Sanchez treading water in 2011, it’s very reasonable for the Jets to start wondering whether Sanchez will mature into an above-average quarterback while their championship window is still open and Rex Ryan’s message hasn’t worn out. General manager Mike Tannenbaum is one of the best in the league at carving out cap space when it looks like he’s up against the wall, but the Jets will need a number of veterans to restructure their deals and trade partners for both Sanchez and wantaway middle linebacker Bart Scott. The Dolphins have the cap space, the ownership obsessed with latching their team onto a star, and the talent around a potential star quarterback to justify Manning heading to Miami. Again, consider the personnel: Reggie Bush as the receiving back. Brandon Marshall as the number-one target. Maybe Reggie Wayne comes in as the 1A guy if Peyton insists. Davone Bess playing the Austin Collie role in the slot. The only problems with the Dolphins? Well, they might be familiar: Their ownership is crazy and their offensive line (besides left tackle Jake Long) is middling. They allowed sacks on exactly 10 percent of dropbacks last year, the league’s highest figure, and that wasn’t all on the quarterbacks. That could open up the door for our number-one team, which only has one of those problems. Pretend you’re Mike Shanahan. Chances are that you need to make the playoffs in 2012 to keep your job. You can sacrifice multiple number-one draft picks to grab RG3 and hope that he’s the next Cam Newton or Andy Dalton, capable of playing at a high level moments after leaving the womb. Alternately, you can go to your owner — who has a long history of being obsessed with five-star free-agents — and save the draft picks by convincing him to shell out the big bucks for Manning. It’s just money, right? Who cares? And then you can go to Peyton Manning and show off your fantastic pass rush and above-average offensive line bookended by Pro Bowl-caliber tackles Trent Williams and Jammal Brown while convincing him that you’re a quarterback away from the NFC East title. Remind him that you beat the Super Bowl champions twice and just keep adding zeroes till he says yes. Right?